Well, I'd better get back to doing laundry and repacking our bags. Write later! This is just so beautiful!! I just love this and the colors are just to die for!! Have a safe trip!! You will have a good time at Lady Liberty--are you taking the circle line tour of Liberty state park? (The ferry that stops at Ellis and Liberty Island?) That is my favorite way to "see" the city. I love going, and anytime someone visits I'm sure to take them there! You mentioned soho, but you should think about checking out the fabric/other goodies shops in the fashion district---dozens and dozens of fabric and lace and edging and other goodies closet-sized shops all in a row down a particular street....MAYBE 5th and 42nd??? At any rate, it's where those "fashion-creators" get all their supplies! I want to go again soon and find some unique bargains! Wow that is so cool...almost there! You did get some stitching done! Love your Finch Song, Nicole. Have fun in NY and I do hope you get to go to Soho. Busy woman! Have a safe trip! Yummy!!! Nicole, please send me your snail mail addy, again. I need to send you a package! Gosh, this is going on my List! It's coming along beautifully, Nicole. Beautiful SB Nicole! I love that pear - so sweet! Have fun on your trip. Personally, a trip to NYC wouldn't be a trip to NYC without a visit to Serendipity for frozen hot chocolate! That is gorgeous! Fantastic work Nicole. Wow! You're so close to being done! Have a great time in NY, Nicole! Hey you're coming up to where I live! Hope NYC treats you well. I love living here. Finch Song looks so gorgeous. Have fun on your trip to NY. Great progress on finch song! Enjoy your trip! Finch Song looks fab!!!! And I love New York City. So much fun. Have a safe trip to NYC, etc.! Finch is looking FabuLouS! Enjoy your time with the kiddos! You're such a great mom to take them to so many fun places! Be safe, for sure! Where on Long Island are you staying? There is a GREAT LNS in Rockville Center called Lazy Daisy Stitchery. Diana is the owner and she is so nice to deal with. If you have time you should try to drop by the shop. It's so nice. Amazing progress, Nicole! Have a fabulous trip ... sounds like loads of fun. This is beautiful!!!!!! I love all the colors!!! Have fun on your trip!!! Finch Song is just beautiful. You've made such great progress. Hope you have a wonderful trip. New York is one of my favorite places to visit! FS is looking terrific, Nicole! 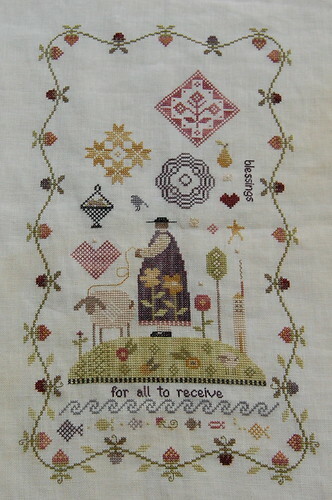 I love that thread colour of the pear and quaker motif on the left side of it. Really nice! Have a fun trip to DC & NY, Nicole. We *always* go to the National Air & Space Museum"> - I just love that one. I've never been to the Statue of Liberty - it's been about 11 years since I've been to NY - I definitely need to re-visit. Have a safe trip. Wow Finch Song is coming along really well, you have been making so much progress. It looks beautiful so far Nicole. Well done. Am I really going to attempt this?? ?